Watch Glory St. Germain and Special Guest Tim Topham in the Ultimate Music Interview. Learn 3 Tips on why piano teachers should be chord hackers! Tim Topham is an internationally-renowned music educator, piano teacher, writer and presenter. He has more than 20 years of experience in education, having taught in the United Kingdom and a number of states of Australia in subjects as varied as music, outdoor education, PE, mathematics and IT. Tim is a creator of enterprising, innovative ideas for music educators. Tim Topham hosts the popular Creative Piano Teaching Podcast, blogs regularly at timtopham.com and speaks at local and international conferences. Tim's passion is helping teachers maximize student engagement through creativity, technology and innovation whilst building sustainable, thriving studios. Learn More about Tim Topham's Inner Circle plus surprise announcement! Tim Topham is Glory St. Germain's Special Guest on the Ultimate Music Interview Series. Glory: Why should piano teachers be chord hackers and what in the world is a chord hacker anyway? I don't know but I'm excited to find out. 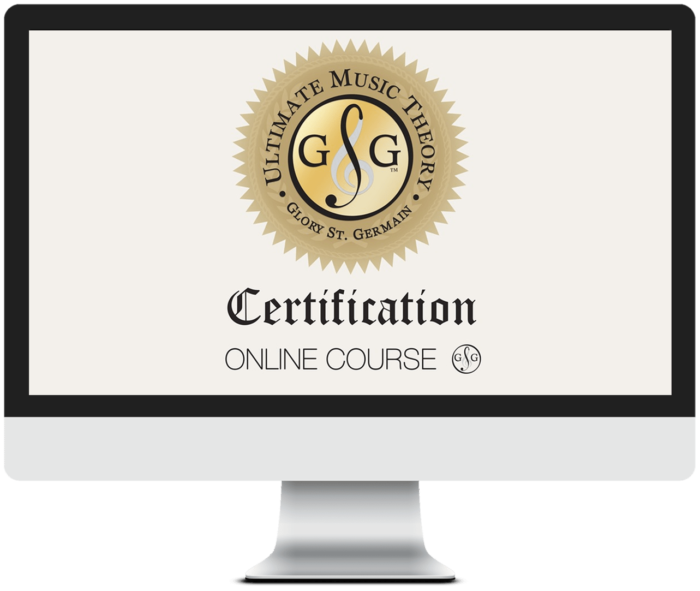 I'm Glory St. Germain from Ultimate Music Theory and welcome to the Ultimate Music Interview. Glory: I have got a super special guest today and I'm so excited and thrilled that Tim Topham has joined me all the way from Australia. Welcome, Tim. Glory: I do want to say he's always in the future because I'm in Canada. I'm celebrating Valentine's Day and he's like, "Well, that's old news," right? Tim: That's right. That was yesterday for us. Glory: That was yesterday. I do want to introduce Tim. Tim Topham is a musician, educator, he is a mountain climber, a lover of road cycling. I'm a runner, so I'm just kind of running behind him. Top notch coffee drinker, as am I, and a desire to get his helicopter pilot's license to he can fly over to Canada. Tim: Right. You've been doing some research on me. Glory: But wait, there's more as they say. Tim hosts the popular Creative Piano Teaching Podcast and I was thrilled to be a part of an upcoming episode talking about all things music theory, of course. Tim is the creator and visionary behind the Creative Piano Teachers Inner Circle membership, which is fantastic. Welcome, Tim. Tim: Thank you. What an amazing introduction. Thank you so much, Glory, and I'm so glad we've connected. It has been way too long and it's just great that we've been able to make it work today of all days on your Valentine's day. Glory: Yeah, on our Valentine's Day. Well, I think, one of the things that really intrigues me and I should invite our guests to please type in the chat box where you are from. I'm from Canada and obviously, Tim's from Australia, but share with us in the comments, where are you from? We're from all over the world as I found out in the Inner Circle, connecting with many teachers. Glory: Now, I'm excited to learn about what's a chord hacker and, of course, you're going to share three tips on why we should know about chord hacking. I know you have a really generous special offer for us today, so thank you for that. Glory: But before we get into that. Maybe start by telling us what was your learning experience? How did you start with your music lessons? Tim: I was very lucky, Glory. I had a super piano teacher when I was younger and it was all caused by this thing, which I've shown some people before. This is a little Casio keyboard I was given as a seven-year-old, I think. Tim: I just drove everyone completely mad by playing this. It's incredibly ... I don't know if it's ... It does this and it's got ... Oh, it's just so annoying and I used to just drive everyone up the wall and my parents eventually said, "That's enough." Tim: "We need to get you piano lessons." I went to a fabulous teacher, Rosemary McIndoe, who lived not far from us in Melbourne and started learning at eight. She was a super teacher. She was, I guess, looking back now, I would say she was of an older school model, so I was reading from the first lesson. But what she did always do, and the thing that I have picked up from her and one of the things I'll be talking about later is that she always let me play what I wanted to play, as well as do the stuff that I had to do. Tim: It's a big thing that I've carried through all my teaching, I encourage every teacher to do. I distinctly remember taking in, In the Mood, I wanted to play. I like jazz on the side. Tim: Chattanooga Choo Choo, I wanted to play and all these things were well beyond my grasp at the time, but she stuck with it. She helped me and that stuck with me the whole way through. I studied some jazz after that for about three years and then, I kind of just did my own thing with the piano after that. Tim: I had a big break from it and came back to it in the last 10 years or so, which is when I started blogging and things. It's been a very varied career and I've done lots of different things. I've been a classroom teacher for about 20 years in a variety of subjects. I think that, the fact that I haven't gone through the traditional method of study, conservatory, university, all of those kinds of things, has been one of the reasons why I look at music education from a slightly different perspective. Glory: Now, when did you start teaching? How do you feel you were teaching differently? How old were you when you started teaching? Tim: I started teaching piano in a more formal sense about 2010 or thereabouts. Really, eight or nine years ago. As I said, I've been a teacher all my life. I have training in teaching. Tim: But the piano really started off when I took on ... I needed some money as people do and I thought, I can play piano pretty well, so why can't I teach it. I took on a student but the student was studying grade four exams and here in Australia, that's a pretty big deal and I had no idea what I was doing, so actually, went back to my teacher, reconnected with her and she helped. She could train me up effectively and teach me what I needed to know specifically about the piano. That's how I got back into it and that was when I started and what I realized, particularly when I started working in a school environment was that other teachers were really surprised at what I was doing in lessons. Tim: Because I would hear this kind of jamming and I'd put on backing tracks and play drums and the kids would improvise and play the blues and they're all like, "What are you doing? How are you doing that? Can you help me?" Tim: That was when I started recording videos on YouTube and writing about what I was doing and that was the part of my life when I really went crazy. I don't know if you've had a period of your life, Glory, or your listeners or viewers have, where you are so passionate about learning about something, you just go to every single event, concert, masterclass, lecture. You take notes, you write books. Tim: You just absorb yourself and I learned so much in those years of 2010 to 2015. Glory: Yup. It's funny that you mentioned when you started teaching, you needed a car so you went back to teaching. When I started teaching at the age of 16, I wanted a car and that's how I started teaching. The reason why but you become passionate about it when you see the results that your students are getting and you and I have shared a lot of stories that I kind of follow in your footsteps as well as that I love to just jam and play with my family members. I think the reason I've had friends was because I played the piano, I had a set of drums. We had guitars and different instruments in our home and so the basement was sort of the music hangout with our friends. Glory: I think it's so enriching and the tools and opportunities that you're providing because a lot of times, as an educator, at 16, I agree. I was like right there and wanted everything that you are now offering but back then, there was nowhere. You either taught classically or it seemed that all the people that knew how to play jazz just magically had that instinct. But now, you're providing us with tools so that we can learn how to do that because it doesn't come naturally for everyone and I think, in connecting with teachers, which you are doing, what do you see as sort of the one thing that's missing when you want to inspire teachers to teach things differently? Tim: Well, the biggest issue is most often, that we tend to teach the way we were taught. Tim: Teachers teach the way they were taught, so we've got this method of teaching that is really strongly stuck in the 1800s. Still, it's just been passed down and down and down and down. The problem that I see and the things that I hear from teachers is that it's just not connecting with students in the same way. Tim: You have that 5% of students who will love exams and competitions and they will practice 10 hours a day and that's fine. We're not talking about those. Were talking about the 95% of the kids that they still want to go to the mall and hangout with their mates. They want to go and watch films, they play video games, they waste time, they eat bad food, all that kind of stuff. Tim: Connecting with them takes a different approach now and as you say, one of the biggest issues is that for teachers, I think a lot of teachers realize that this might be the case and they're perhaps losing some students, who they used to keep. The problem is then, well what do I do? How do I teach without a book or do some improv? That's why I started creating the resources. Glory: Yes. Yeah. One of the things too and you just nailed it when you said that things have changed and probably because of technology as well because when I was a student, I've heard music on the radio or because my Dad would buy a record and I would hear it that way, but now, students are coming in with their iPhones, their iPods, whatever electronic devices and say, "I want to learn this. I want to learn this." I think that kind of leads us then to not keeping us in suspense anymore because if you're interested in learning about all of this, you need to type in the chat, chord hacker. Glory: I just can't wait to hear all about this. Share with us, go ahead and type it in there, chord hacker, what's a chord hacker and how as I, as a piano teacher, how can I learn about this and what are some tips to help me out with my teaching? Tim: Okay. Firstly, for those who are thinking the word hack means to break into computer systems, that is true. But if you look in the urban dictionary, so in common usage today, the word hack as you probably have heard, Glory, kind of means to be creative with ideas around something and maybe find some shortcuts and stick things together that maybe didn't go there before and kind of make things up as you go. That's what hacking is. Tim: I based my approach on the approach I teach teachers around this idea of chords, very heavily chord-based because that's the real thing that's missing in a lot of the traditional education we find in most instrumental classes to be honest, but particularly for piano. By the way, I should say I have nothing against reading. I've got nothing against classical music. There is a place for all of these things. All theory, sight reading is important. Tim: But what I see missing is chords. To chord hack just means to think a little bit about how you can add some chord knowledge to your student's lessons. I do that and I really encourage teachers to do that in three ways. Tim: I guess, the first way is just to explicitly teach them about chords. What they are, how integral they are to the construction of music and how particularly, the pop music that they're all listening to is made up of chords and often, very few chords. A knowledge of that is just so, so crucial. That's kind of my tip number one. Teach them about it. Tim: If you're wondering how, you can actually be quite explicit. Just say, "All right, we're going to play something that sounds like a bit of pop music and here are some chords." Just use some C-F-G and A minor. White notes, triads, repetitions as simple as you can. I've got videos you can watch on YouTube for free. Just search Tim Topham. You'll find stuff about chords and how I do that. That really is number one. Tim: I think a better approach though is to ask a student, "What would you like to learn? What pop song would you like to learn?" Then, don't make this fatal error because I see teachers still doing it. Please don't do this. What teachers will do, Glory, is they'll get that song. They'll download the full version. Tim: They'll go away and spend hours and hours rearranging it for their student in a simpler version and now, produce that at the next lesson. Tim: Say, "Let's read this pop song. It's the song you wanted and you can play it because it's easy." Unfortunately, oftentimes, the arrangement, even if you've done a fantastic job, just doesn't sound like the original. Tim: But more importantly, you've missed the biggest learning opportunity for your student. That is to watch you simplify something in a lesson back to its basic chords is one of the most important skills a student can be given. Tim: Take that song. You might find the first page on music notes. They're always free, the first pages. Often, students want to learn the first page, so just pull it apart. Have a look. Just read the chord symbols above, teach them how to play the chords, make it simple for them. Don't go and spend 10 hours rearranging it and bringing it the back because they haven't learned much from it. Tim: That's my tip number two. Do you agree with that kind of approach? Glory: You know what? That is brilliant because I agree with you so much. Think the other too is that when you do get a simplified version, sometimes it's so simple that they've taken the rhythmic pulse our of it and just made it all this straight, which it isn't. Glory: That drives me crazy because you lose the whole point of that melodic line, so I think, to give them that chord structure to take the original and say, "Let's just break it down," and a lot of the times, then by hearing it, they're going to ad lib and straighten out the rhythmic pattern because they know how it goes but they've got a foundation of chords. That's brilliant. Tim: Right. One other mistake that teachers feel if they don't do, they're bad teachers and that's to look at an arrangement with a complex rhythm and sort of blow it up to big size and then, write in and get students to clap through this incredibly complex rhythm. Guys, yes, it's important if you're learning a Beethoven Sonata or a Haydn or something like that. Yes, let's get the rhythm right and let's learn how it works. Tim: For kids that just want to play a bit of pop song, just get them to feel a sense of beat to know where the chords sit and the shapes and then, play it as they hear it. They'll hear it in the head and this is a great aural activity. There's lots of things that you would love doing in your oral and theory work as well. Tim: Get them to listen, get them to play it. Get them to sing it even better first and then, play it. That's my tip number two when it comes to working with pop with students. Tim: My third tip is about how to actually fit this in a lesson because this is the other issue that teachers often have and so, I've got what I call me three keys. I work on segmenting all of my lessons into three sections. The first sections is technique and I include in that technique, oral, sight reading theory and those kinds of activities. That tends to be what I start my lessons with, although I do like mixing it up. Sometimes routine is good, depends on the student. I always have an element of something technical in my lessons. Tim: Section number two is reading and that might be a pop song, but it might well be your classic music or your exam repertoire or your recital preparation, whatever it is, but your reading is so important and I'm a huge believer in importance of students being able to sight read and read music. That's part two. Tim: Then, finally, part three, can you guess what it might be, Glory? Tim: Right. That creative element. Improvising, composing, chord hacking, just mucking around with chords, teaching them a cool chord progression. There's three main pop chord progressions out there. I think all students should know how to do it, play those. If you're not sure what they are, then, I've got a resource about that as well. If they are interested in a pop song, then you might do that at that stage or if they'd like to do something by ear. Tim: Here's an activity that I love doing with students. I love getting them to try, and listen and play bass lines because that's a fundamental activity because it gives you a sense of harmony but students are not really used to doing it. That can be a great activity. Tim: That's kind of the three ways I break up a lesson. They don't all get the same amount of time. The reading often gets the most time in the middle. The chords, probably the second most time. Then, the technical, the third most time. But again, it depends on what's coming up, when the recital is, have they got an exam, et cetera. Glory: Right. The way you described the lesson is almost like coming in and having your full meal deal. You've kind of got a bit of an appetizer and then you're main course. You're saving the dessert for the end because you do look forward to that part. I like the idea of structure. You're right. Sometimes you mix it up but I think for the most part and I found, too, interesting that you mentioned about learning the bass part when I know that you play multiple instruments as well. Glory: I have had numerous students coming into class and they're playing it at quite in advanced levels and they know how to read and they know their chords and they're a jazz band at school and all of a sudden, the band leader director will say, "Who plays these?" No one puts up their hand. Then, he'll say, "Well, who plays piano?" A few. "What level are you at?" Then, he'll take the most advanced student and say, "Now, you're the bass player." Glory: It's because they have learned that that bass line, they played it, they can read it. They read bass clef and so, I think we're doing our students such a service because now, many of my students are playing more than one instrument. They're now playing bass because they've had too and they come in with those chords and they don't have time to really learn it at school as far as being just part of a group where you're just learning, so they send it along to their piano teacher. I think, the earlier that you can start, the more fun and creative they can have with that music and how much fun is it to listen to a song that you might just hear even when you're walking through the mall where there's music playing and then, go home and just figure it out because you've got some sense of how that all works. Listen for the bass line and then, put the melody on top. Glory: You're building life musician skills. Glory: Something that I love about your approach, Tim is that you're creating lifetime music lovers, as opposed to kids that are taking piano lessons for a couple of years, then they quit because it's too hard or it's not fun or they don't understand it. Glory: I find now, in the inner circle community and I've only been a part of it for a short while but while I've been in there and seeing teachers from all over the world, what impresses me the most is that teachers are so excited to learn new ways to connect with students and build the community of connecting. As I mentioned, my daughter's a music producer in Las Vegas and she connects with musicians from Australia. They send files back and forth. It's no longer a, "I'm a piano teacher in my area, but now, we can just learn from so many other people around the world." It's a time to celebrate that. Absolutely. Tim: Yup. I absolutely agree. Aren't we lucky that we live in an age where we can do it so easily. Tim: Just picking up on your encouragement of students to play bass. I have encouraged many of my students to do two things at school because they're pianists and they're often on their own. Tim: Join a jazz band and play the piano but if not, join the orchestra and play percussion because orchestra leaders love kids who know how to play tune percussion because it's laid out like a piano. Encourage your students to do that or play drums. I played drums when I was at school and it was the best experience for a pianist to learn drums and I've got one of my boys, actually, who I teach now, has picked up drums. You've got a kid at home and the ability for him to play in time has just gone through the roof. Tim: His coordination and his listening better. The thing he still does do, which I've got to work on is he still speeds up though. Tim: That's one of those things to work on. Glory: That is a great deal for drummer. I played drums as well. I remember my first set of drums, it was a Christmas present and I thought had just died and went to heaven. I came out and there below the Christmas tree was this set-up of drums. I was like, "Oh my goodness," and it does really take a lot to have that discipline to remain steady. What a cool thing to give your students an opportunity. Tim: Yes. I don't have enough space here. When I've done that before, I've been at schools where they do have lots of instruments, yeah. I would love a kid in a corner or even a gym bay or something. Glory: Yes, yeah. Yeah. Actually, you're making me think. I might just bring up the gym bay and put it in my music studio. You've done obviously so many amazing things. You make sure to put in your chord hackers because we do have that special little treat coming up for you but I wanted just to talk a little bit about how you have created this massive resource, the Tim Topham and I'm referring to it as a program because you've got your creative piano teaching podcast, your blog, your webinars, your courses, your Inner Circle. I mean, there's a lot of opportunities to learn from all of that. Glory: Can you just sort of expand a little on how we can connect and what the Inner Circle is all about? Tim: Absolutely. I don't know if you made the formal announcement. You mentioned it a couple of times. I'm very excited on your show to be able to say that Glory is our most recent and newest expert teacher in the Inner Circle. Tim: We are incredibly excited to have her with us because we haven't actually got a theory expert, although that's only one part of everything that you give us, I know, Glory because you've already started sharing so many great things. Thank you very much, Glory, for being one of our expert teachers. Tim: It's great to see you connecting with our members and I know we'll have much more of that coming up. But for teachers who aren't too familiar. Some of them may remember if they've been following me for any length of time that I put out a course at the end of 2014, I think now, which was all about teaching pop music, so helping teachers teach pop music. I launched that as a single course because I knew there were hundreds of teachers who'd asked me for help with it. I thought, "Right. I'm going to put it together in a course." I sold a lot of those courses. Tim: What I found though was that teachers who buy courses as a one off and I'll put my hand up, I've done this before, sometimes you'll buy it particularly if there's a bit of discount and then, forget to use it because I don't know, life gets in the way, all right. Tim: The other thing I was finding is that I wanted to create a sense of community around people who were doing similar things in there lessons and I also wanted a place where people could ask questions and not just shoot them at me but have the power of the community to help answer those questions because I also, Glory, put my hand up and say, "I am not the best teacher out there. I'm not a specialist in every single area. I make mistakes. My students sometimes quit. I'm very normal." Tim: But what I do have skills in is bringing people together. Tim: Bringing lots of information out of people and having that sharing environment. I thought, "You know what? I'm going to create a community and I'm going to put courses in that community, but I'm also going to have forums, where they'll going to ask questions." That's where the Inner Circle came out of and it's grown very well and we've been redeveloping it. We launched an app last year. Tim: For those of you who are on ... We're watching this on Facebook right now, so many of you will be in the Facebook group on Facebook and one of the things I really wanted was for my community to have this easy access as a Facebook group for quick answer. Open the app, quickly ask a question because I got to go back and teach and I'll come back a little bit later, I'll look at my phone, there's a notification, I can see what the answer is. Tim: That was something that we launched last year. But as well as that, we've got all our courses, we've got lots of lesson plans, downloads, training videos, how to launch websites, how to teach a group, everything you need. That's what it is and we've got delightful people like Glory in there to help our teachers as well become chord hackers. Glory: I love the chord hackers. I know that Tim has got a really wonderful opportunity for all of you to become part of the inner circle. When I was in there yesterday and what was so cool is that I noticed there was different countries that you could just sort of connect with teachers that are in your area and in reading through some of the notes, so of course, I'm from Canada, so I clicked on Canada and as I opened it up, I recognized many teachers in there already. Tim: I know Hetty, yeah. Glory: I said, "Hetty," i'd like you to tune in and she said she was going to try. She might be on the call so I'll give a shout out to Hetty if she's there. I said, "I have a surprise announcement but you got to tune in." I'm joining the Inner Circle as the music theory expert and I'm absolutely honored. Glory: As I went through, I recognized a bunch of names and of course, Derek Campbell, my dear friend from the US. Tim: Yup. Sarah's one of our other experts, who joined us last year. Yup. Glory: Yes, yes. Also, Carol Matz who was one of our guests. It was just so wonderful to see almost a few old friends that I didn't notice some teachers saying, "Oh hey, can you reach out?" Met with Rosemary. It's just such a community and I really love it because sometimes I think we find, even when you go to a conference, they might be all registered music teachers, they're all this, they're all that and you might feel a little intimidated that maybe you think they know more than you do and you're afraid to ask questions and having that community, you can just ask anything you want. There's no silly question. Somebody will give you the answer you're looking for, so it's a pretty cool opportunity. Tim: Right. I will say two other quick things about the community being off Facebook. Two of the issues that I find about using Facebook groups is one, I'll go on there and I'll get distracted because they designed the platform to distract you. That's the point. I want to keep you on there as long as possible. If you want to avoid that distraction and time wasting, then this is another opportunity that's got that community but without the distraction. Tim: Secondly, I do sadly find that a lot of the groups online because they're quite anonymous in some ways. There's a lot of unfortunate conversations that go on and people that are really rude to each other. I find it really distressing. Tim: I didn't want that in my community and so, you don't get any of that because we really look after everyone who's there. We know everyone who's there and people, obviously, commit some of their income to join us. It just adds that level full of people that are there. Tim: Glory, do you want me to tell you what the special offer is? Tim: Fantastic and do you want me to give you the link as well? Tim: Yeah? Beautiful. All right. I'm very pleased to offer anyone who's watching the replay or the live and anyone who love Glory and we all love Glory, if you would like to join the Inner Circle community, you can join up today on a professional plan and your membership for $150 off the full price. The full price is 399 US, so this will bring it down to $249 US and it's locked in forever. You never pay more than that and every month, we add more stuff. It only grows in value, which I think, is a great deal. Tim: $249 will get you inside. Hang out with me, hang out with Glory and the link you need timtopham.com/glory. Nice and easy. Glory: Nice and easy. If you can't remember that, just type in the words Glory rocks and we will make sure to put that link right in there, so you can just click and go right to the Tim Topham page. Glory Rocks will get you in there. Glory: We've got a lot of people hanging out with us today and I'm absolutely thrilled. I know we'll go back in and answer some of the questions that have been popping up here as we go. Oh, Jim just says, "Wow, we've created a musical monster. Becoming addicted." Tim: Yeah. It's a bit like that sometimes. I know what you mean. Glory: Sometimes it is becoming addicted to learning new things and I'm an avid student. I love learning. I had great session yesterday as I was going through the Tim Topham Inner Circle and I was learning new things about just navigating through it but also learning about that I already had some friends in there, which was fun because when you go in, you might say, "Oh, you know what? I already know that person." Or maybe you're planning a trip to Australia and you want to connect with some teachers when you're going on your summer holidays or whatever it might be but it's an incredible opportunity to not only meet all those people but view the courses, be part of the membership. As Tim mentioned, there is a podcast in there and I've enjoyed many of them. Glory: I told Tim I usually go to bed with my little earbuds in and I put it on. I have this voice inside my head but the interviews are amazing. They're engaging, you're always learning something new and they're entertaining and uplifting and motivating because as teachers, we need to always get something that will inspire us, so we can inspire our teachers. Thank you, Tim, for providing all those resources. Tim: It's a pleasure. Look, Glory, I love doing interviews. I love hanging out with people like yourself, having a chat. If we were local, I'd be in a café with you now having really good coffee. Tim: Because we can all learn from it. I'm so glad you've been enjoying those. Glory: They don't know. You're just here. Tim: Okay. You're like, "I'm actually meditating." Glory: Yes. Every now and then, I laugh. They go, "What are you thinking today?" Glory: Yeah, it's great. Well, thank you for sharing your three chord hacking tips with us today. They were just a great value and thank you for that. Make sure to click on the link. If you put Glory Rocks in the chat box, Sheena, my assistant will make sure to put in the link for you and I will see you on the inside of the Inner Circle. Make sure to catch up with me. I'll be in there sharing all kinds of music theory tips and anything else, any questions that you may have in addition to obviously, all our other things. Glory: Thanks again Tim. I really appreciate it. Tim: It's been super. Happy Valentine's Day. Glory: It's just some flowers upstairs. Now, that's all it is. Tim: That's it. Well, have yourself an amazing weekend. Glory: Beautiful. Bye everyone. Thanks for joining us. Tim: With that teacher passion.